Medications - body, causes, Psychopharmacology, How Do Psychiatric Medications Work? Medications for mental emotional, behavioral, and mood disorders are prescribed by medical doctors called psychiatrists, often as part of a treatment plan that includes psychotherapy (talk therapy). Psychopharmacology (SY-koe-far-ma-KOL-o-jee) is the study of how medications affect moods, thoughts, and feelings. Psychopharmacology is an exciting new science. When our grandparents were young, there were no medications that helped people with attention deficit hyperactivity disorder concentrate at school or work, no medications that helped people with schizophrenia quiet the voices in their heads, and no medications that helped people with depression find the energy to face a new day. Today there are prescription medications for these disorders and many others. Examples of well-known psychiatric medications include Prozac and Paxil (antidepressants); Valium, Xanax, and BuSpar (antianxiety medications); lithium (antimanic medication); Tegretol and phenobarbital (anticonvulsants); Thorazine and Haldol (antipsychotics); and Ritalin and Concerta (stimulants). Psychiatric medications target the complex chemistry of neurons and neurotransmitters in the brain and central nervous system. 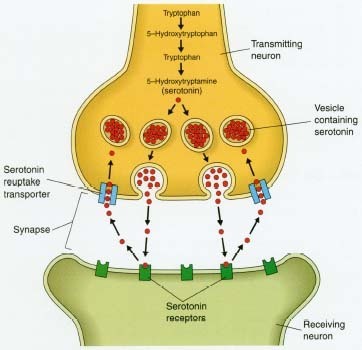 Neurotransmitters such as serotonin (ser-o-TONE-in) and dopamine (DOPE-a-meen) are manufactured in neurons (nerve cells) to carry messages from cell to cell, crossing the synaptic gap between the axon (transmitting terminal) of one neuron to the dendrites (receiving terminals) of the next neuron. The chemical structure of each neurotransmitter is designed to fit its neuroreceptor the way a key fits a lock. A change in a neurotransmitter's chemical structure, or an imbalance at any point in this complex process, may affect emotions, moods, thoughts, behaviors, and mental states. Psychiatric medications help restore proper balance. Important neurotransmitters include serotonin, dopamine, epinephrine, norepinephrine (monoamines), acetylcholine, gamma-aminobutyric acid (GABA), glutamic acid, enkephalins, and endorphins. Psychiatrists and psychopharmacologists study the research about medications before prescribing them. They attend training sessions, read medical journals, and review descriptions in the Physicians' Desk Reference (PDR) medical directory for details about how specific medications work (mechanisms), how they help patients (beneficial effects), whether they cause side effects (adverse effects), and whether they can be used safely with a patient's regular diet and other prescription medications (drug interactions). improving concentration, memory, and sleep. Psychiatric medications can help correct imbalances in the neurotransmitters that affect mood and behavior. Selective serotonin reuptake inhibitors (SSRIs), such as fluoxetine (Prozac), fit into the serotonin neuroreceptors on neuron dendrites. This blocks serotonin from entering the neuron and keeps it active for longer periods of time in the synaptic gaps between transmitting and receiving neurons. Serotonin (5-Hydroxytryptamine) is a calming neurotransmitter that is manufactured in nerve cells from the amino acid tryptophan. Turkey is one good source of tryptophan, which may help explain why people often feel relaxed and sleepy after Thanksgiving dinner. Selecting the right medication and the right dosage are complicated tasks, requiring that doctors take detailed medical histories from their patients and their patients' families. Doctors must know about other medical conditions the patient may have, about other medications the patient may be taking (including aspirin, alcohol, herbal supplements, and tobacco), and about the patient's diet and daily life. Doctors also must monitor patients who are taking medications to ensure that symptoms improve and to adjust dosages or change prescriptions if side effects occur. muscle spasms, slurred speech, or a movement disorder called tardive dyskinesia. The complex chemistry of psychiatric medications and the central nervous system also can affect other body organs and systems, such as the blood, bone marrow, thyroid gland, liver, and kidneys. MAOIs can interact with cheeses, wines, or cold medications to cause seizures. Some medications can interfere with a child's normal growth and development. Others can pose serious risks to pregnant women, nursing mothers, and their babies. Older adults who are taking multiple prescriptions are at particular risk for harmful drug interactions. Some psychiatric medications also can lead to addiction, withdrawal symptoms if the medication is stopped, and accidental overdoses. People who use psychiatric medications must see their doctors regularly and report side effects as soon as they notice them. Methylphenidate (Concerta, Ritalin) is a stimulant. It often is prescribed to treat the symptoms of attention deficit hyperactivity disorder (ADHD). When misused, however, methylphenidate can harm the body in the same manner as other forms of amphetamine abuse. What Is Next in Psychopharmacology? The science of psychopharmacology is less than 50 years old, and discoveries are still being made at a rapid pace. Researchers are developing new medications that target more than one neurotransmitter at the same time, which means that they can improve symptoms in multiple categories at once. Also in development and clinical trials are newer medications with fewer adverse effects, reduced risk of addiction and withdrawal symptoms, and less chance for tardive dyskinesia. Psychiatric medications are most effective when the people who take them work with psychiatrists and medical doctors to update their prescriptions as often as necessary. Tardive dyskinesia (TAR-div DIS-kuh-NEE-zhuh) is one of the most distressing adverse effects of antipsychotic medication. It is a disorder of the neuromuscular system that causes muscle spasms and tics, which are involuntary movements affecting the eyes, tongue, face, neck, fingers, arms, toes, or legs. Tardive dyskinesia may disappear if the medication is stopped, but sometimes it becomes a chronic condition. People who develop tardive dyskinesia often continue taking their medication because the beneficial effects outweigh this very serious adverse effect. American Academy of Child and Adolescent Psychiatry, 3615 Wisconsin Avenue Northwest, Washington, DC 20016-3007. This professional organization for psychiatrists provides information about medications for children and teenagers. American Psychiatric Association, 1400 K Street Northwest, Washington, DC 20005. The leading professional organization for psychiatrists in the United States offers expert information about medications. U.S. Food and Drug Administration, 5600 Fishers Lane, Rockville, MD 20857-0001. This government agency provides the latest information on new drugs and sound advice about the proper use of medications. U.S. National Institute of Mental Health, 6001 Executive Boulevard, Room 8184, MSC 9663, Bethesda, MD 20892-9663. This government institute publishes an informative booklet for families called Medications (publication 95-3929), which also can be downloaded from its website in PDF format. It also posts many other fact sheets at its website offering safe and reliable information.